PAPAR PLACE-NAMES IN THE NORTHERN AND WESTERN ISLES OF SCOTLAND: A PRELIMINARY ASSESSMENT OF THEIR ASSOCIATION WITH AGRICULTURAL LAND POTENTIAL. Ian A. Simpson (School of Biological and Environmental Sciences, University of Stirling), Barbara Crawford (Department of Medieval History, University of St. Andrews) and Beverley Ballin Smith (Department of Archaeology, University of Glasgow). The twenty-eight papar place names (Old Norse: ‘priest’ or ‘monk’) of the Northern and Western Isles, thought to have been given by Viking and Norse settlers because of association with Celtic priests, have emerged as an important body of evidence from which to consider early ecclesiastical activity across the north Atlantic region. Attempts to understand the cultural and geographical contexts of these place names has, however, resulted in a diversity of opinion that includes eremitic, evangelical and retrospective place name interpretations. Suggestions that most of these place names are located on islands and in marginal areas has been used to support an eremitic interpretation of the papar in the Northern and Western Isles (MacDonald, 1977). Such an interpretation is also suggested by archaeological evidence identifying early monastic settlements on isolated stacks of the Northern Isles (Brady et al., 2000; Brady 2002; Lamb 1974) and by early Irish documentary sources. These indicate the specialised use of the term papar to mean hermit, a view emphasised by the Irish scholar Dicuil writing in the 820s AD who noted solitude seeking papar in what was most likely to have been Iceland and Faeroe (MacDonald, 2002; Dumville, 2002; Tierney, 1967). Their subsequent, possibly hurried, departure on the arrival of Viking settlers, leaving no archaeological or palaeo-environmental trace in Iceland (Buckland et al., 1995; Vésteinsson, 2000; Íslendingabók, Landnámabók) and contested palynological evidence of cereal cultivation in Faeroe (Jóhansen, 1978; Hannon et al., 2001; Arge, 1991), further reinforces eremitic and ephemeral perceptions. Its has, however, been pointed out that at least some of the papar place names are located in areas of high quality agricultural land which had long been occupied prior to the arrival of the papar or the Norse (Lamb, 1974; Rendall, 2002). This has led to the suggestion that the papar may have been an evangelical group, possibly originating from Iona, and working and living amongst the local population in their missionary areas of settlement (Radford, 1983). In doing so, it has also been suggested they may have introduced new, improved, techniques of agricultural land management, including arable land manuring strategies giving rise to anthropogenic raised soils (Barber, 1981; Simpson and Gutmann, 2002). Further support for this hypothesis is suggested by evidence of a distinct increase in agricultural activity around the sixth century AD in western Ireland (Mitchell and Ryan, 1997; O’Connell et al., 1988; Moloy and O’Connell, 1991; 1993), the Hebrides (Fossitt, 1996) and Shetland (Bennett et al., 1992). However, convincing and unequivocal evidence of agricultural improvement associated with the papar is yet to be presented. Both eremitic and evangelical interpretations of the papar place-name evidence assume that they were given at or shortly after Viking and Norse settlement of the Northern and Western Isles to a resident papar population. Some authorities have found this an unlikely scenario, given the disruption that Viking activity brought to ecclesiastical settlement, and have postulated an alternative, radical, view that these place names were applied retrospectively sometime after Norse conversion to Christianity. Such naming may have taken place early after Norse conversion in the second half of the ninth century and the tenth (MacDonald, 2002), or may have been as late as the twelfth century, with the Church of this time seeking to relate itself to an older Christian tradition (Lowe, 2002). However, recent onomastic and linguistic perspectives on the papar names have led to a reassertion of an early naming by incoming Vikings and Norse due to the actual presence of papar (Gammeltoft, 2004). It is evident that there is considerable debate over the meaning and significance of the papar place names based on different approaches, but as yet there has been no comparative analyses of the places associated with these names. By undertaking such analyses, deeper understanding of why such areas were given papar place names together with their cultural significance may emerge. This paper focuses on soils and agricultural land qualities associated with the localities of the twenty-eight papar place names in the Northern and Western Isles and in Caithness, by undertaking a desk-based assessment of arable land potential. If the papar were practical agriculturalists, as well as spiritual leaders, then we might expect to find papar place name elements associated with areas of land that were suitable for agricultural, including arable, activity; conversely eremitic papar would not have had such requirements. Further refinements of this hypothesis may also be possible by considering whether differences in land suitabilities for agriculture are evident between types of papar place names evident in the Northern and Western Isles and in Caithness, or between the different island groups. This desk-based exercise is followed by a preliminary field investigation that sets out to identify areas of agriculturally-improved soils, and the occurrence of anthropogenic raised soils in particular, associated with papar place name locations. The two areas selected for this field-based consideration are Pabbay (Harris) and Paible - Taransay, (Harris), both in the Western Isles. In undertaking this desk-based survey and by making preliminary field observations, new insights may be gained into the role and contribution of the enigmatic papar to north Atlantic cultural landscape history. · Historical (including early maps) and archaeological indicators of cultivation practice. · Soil survey information derived from the Macaulay Institute for Soil Research 1:250,000 and 1:50,000 sheets for Orkney, 1:250,000 and 1:63,360 sheets for north-east Caithness, and 1:250,000 sheets for Shetland and the Outer Hebrides (Soil Survey of Scotland, 1982a; 1982b; 1979; 1970). This data included soil series (at 1:50,000 and 1:63,360 scales), soil associations, component soils, topography and land capability for agriculture. Where the location of an early chapel site was known from the archaeological and historical review, note was made of the topography, soils and land capability class on which it was located. · First preference for brown forest soils and machair brown calcareous soils (although with possible erosion limitations); Table 1, preference category 1. These soil types would give maximum flexibility allowing both arable and livestock based activities. · Second preference for podzols, humus-iron podzols (nutrient limitations); Table 1, preference category 2. These soil types would allow both arable and livestock based agricultural activities, but with less flexibility and requiring management of manures to maintain fertility of arable systems. · Third preference for gley soils (wetness limitations); Table 1, preference category 3. These soil types would allow both arable and livestock based agricultural activities, but with less workability and requiring a degree of drainage to maintain arable activity. · Fourth preference for peaty gleys (major wetness limitations) and peats (major wetness limitations); Table 1, preference category 4. These soil types would have supported limited agricultural activity, restricted to domestic livestock grazing. The identified preferences are based on early agricultural requirements, rather those of the present day that have advantages of extensive drainage systems, inorganic fertiliser and mechanisation. For this reason, while modern land use capability maps have been used to guide understanding of early land preferences they can not be regarded as a definitive assessment of early agriculture land requirements. To provide a greater security of historic interpretation for the soils-based agricultural assessment, the historic and archaeological survey of cultivation practice indicators was reviewed to assess the feasibility and practice of early agricultural activity in the place name localities. It must be emphasised that the data used in this analysis have a number of limitations. It is entirely likely that the papar occupied more localities than those that carry their name – there are islands in the Hebrides where early monastic communities are known to have existed, such as Eigg. Furthermore, use of the 1:250,000 scale soil maps is limited by soil mapping units comprising component soils rather than individual soil series. More precision in soil classification is needed to examine the relationship between soils and papar localities in greater detail, and although Orkney and Caithness is mapped as soil series at 1:50,000 and 1:63,360 scales respectively, this scale of soils mapping is not available for the Western Isles or for Shetland. Similarly, the archaeological and historical data base of evidence for agricultural practices is derived from desk-based review, and where evidence of cultivation practice is found it does not necessarily relate directly to the activities of the papar, only indicating that agriculture was feasible and practiced in the locality. To give some support to the desk-surveys, preliminary field survey of soils by hand auger was systematically undertaken in two papar place name localities - on Pabbay and Taransay in the Western Isles (Figure 1). 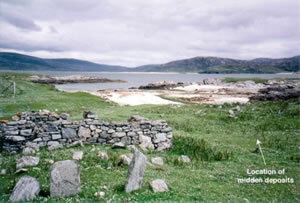 On Pabbay, the occurrence of two chapel sites, Teampull Moluag and Teampull Mhoire with a graveyard and early Christian sculpture at Bailenacille implies a community and ecclesiastical farm and so soil survey focused on this area. On Taransay two chapel sites with possible Celtic personal names, St Keith’s and St Taran’s and associated graveyards are located at Paible, which from its name was associated by Norse with the papar – again soil survey focussed in this area. At each of the localities a free soil survey approach was adopted and soils described in the field using conventional soil science terminology (Munsell colour, texture). Table 1 provides a summary of relationships between papar place names, soils and archaeological and historical evidence of cultivation practices across the Northern and Western Isles, and Caithness. Of the twenty-eight papar place name localities, seven (25%) are associated with first preference soils for agriculture, with five of this group also having associated archaeological or historical evidence of arable cultivation in the area. Seven papar place name localities (25%) are associated with second preference soils for agriculture, all of which also have archaeological or historical evidence of arable cultivation practice. Similarly seven papar place name localities (25%) are associated with third preference soils for agriculture, again all of which have supporting archaeological or historical evidence of arable cultivation. There are five localities associated with fourth preference sites (18%), with historical evidence indicating these areas are dominantly pastoral. Two localities (7%) are clearly associated with a stack or rock site and are not considered to be associated with agricultural activity. Consideration of the different types of papar place names (Table 2a) indicates a clustering of the twelve Papil / Paible / Bayble place name localities (settlement names) locations associated with second and third preference soils. However, even on the poorest quality soil (Papil, Fetlar, Shetland) there is evidence of arable cultivation activity. The ten Papay and Pabbay names (island names) occupy the full range of soil preference categories, with small clusters at the extremes (preferences 1 and 4) of the distribution. The six topographical papar names also occupy the full range of the distribution; there is however no evidence of clustering within this distribution. Examining each of the three island groups (Table 2b) demonstrates that the ten papar place names in the Western Isles are dominantly associated with localities that are first preference soils for agriculture, with a full range of preferences also evident. In contrast, five of the Orcadian papar place names are clustered within the third soil preference category with two in the second soil reference category. Further marked contrasts are evident in Shetland where four of the nine papar place names are associated with the second soil preference category with a further four in the fourth soil preference category; one papar place name is associated with the third soil preference category. The number of papar place name locations in Caithness are only two; little can be concluded from this limited size of population. Table 1: Summary of relationships between papar place names, archaeological / historical evidence of cultivation practice and soils information. b) number of papar names in island group. In general the results suggest a slight trend towards the association of papar place name locations with better quality soils, or at least soils that, with appropriate and careful management of nutrients and water, could be used productively for early agriculture. These observations suggest that if agriculture was practiced, land management and land organisation techniques were robust enough to overcome inherently poor agricultural land in the Northern and Western Isles and Caithness. The more detailed breakdown of data indicates marked and potentially important contrasts when integrating the relationships between island group and soil preferences and between place name type and soil preferences allowing different patterns of organisation to be suggested. The dominant occurrence of papar place names with the best land in the Western Isles perhaps indicates that the papar were seeking out the best land and that such land was available for occupation on remoter, or more secluded, island (Pabbay) locations with or without a small secular community. It is of interest that, although the sample size is small, the settlement (Papil) names are associated with a range of soil preference categories, perhaps implying a group for whom living alongside larger secular communities was more important than good quality agricultural land in secluded locations. Some support for this view comes from the preliminary field based observations at Taransay (see below). A similar pattern is evident in Orkney with a suggested contrast between a papar group occupying remoter small island areas with high quality agricultural land, and a group more associated with the settlement names locating themselves where secular population levels were probably greater, but generally on marginally poorer land. In Shetland a different pattern emerges where land of relatively poor quality – but suitable for the grazing of domestic livestock - is incorporated into papar place name locations. Here we suggest an addition to land management organisation associated with papar communities, with grazing livestock separated from the main settlement area in order to conserve environmentally limited levels of rangeland productivities. Free soil survey of Bailenacille, Pabbay established the occurrence of a deep top soil buried beneath wind blown calcareous sands. The fossil deep top soils are typically dark brown sandy silt loams with occasional small charcoals and between 40 and 60cm in thickness overlying imperfectly drained mottled soils (Table 3a). They are located immediately adjacent to the Teampull Mhoire site (Figure 2) and extend at least 150 metres to the north and east of the chapel site on south and south-east facing slopes (Figure 3). These soils are similar to the anthropogenic deep top soils of West Mainland Orkney (Simpson, 1997) and to the buried anthropogenic soils at Old Scatness, Shetland (Simpson et al., 1998). Such soils have been demonstrated to contain a soil record of past land management practices associated with their formation; they imply specific manuring strategies requiring the integration of animal manures, turf and, almost certainly, seaweed, as well as intensive cereal production. 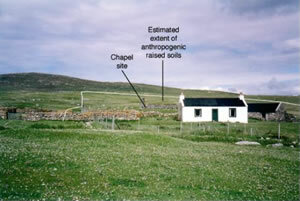 Their close association with the chapel sites on Pabbay, within the Bailenacille locality, opens the prospect of considering the role that the Papar may have had in introducing soil management techniques to Pabbay, and possibly other areas of the Western Isles. It is also possible to speculate that there may have been an early church-farm complex in this locality. 65-75cm 7.5YR 5/4 with rare small 7.5YR 7/8 mottles; sandy silt loam; clear boundary to bedrock. 105-110+cm 5YR 5/3; occasional medium 7.5YR 7/8 mottles; sandy clay loam. Table 3: Field descriptions of cultural soils and sediments: a) anthropogenic raised soils associated with Teampull Mhoire, Pabbay; b) midden deposits associated with St. Keith’s Chapel, Taransay. 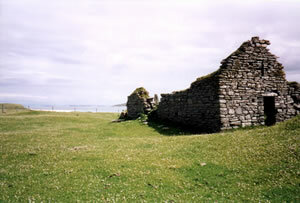 Figure 4: St. Keith's Chapel, Taransay. In contrast, extensive survey in Paible, Taransay, revealed no significant evidence of anthropogenic raised soils; soils in the locality are characterised as wind blown calcareous sands with gleyed soils beneath the sands, and peaty gleys. It may be, however, that evidence of earlier arable and raised soils is buried at depth beneath sand, or that arable areas have been lost to coastal erosion. Evidence of midden deposits up to a metre in thickness were however identified immediately beneath and adjacent to St. Keith’s chapel (Figure 4). This midden material is characterised as dark brown and dark grey brown sandy silt loam and silt loam with the occurrence of shell, small charcoals and small domestic mammal bone fragments (Table 3b). These observations imply that the chapel site was founded on earlier site occupation, suggesting that the papar may have settled in an already full landscape. This discovery opens up the prospect of examining relationships between incoming Celtic ecclesiastical settlement and earlier occupants of the landscape – were the papar given these locations; did the existing residents stay or did they move? While recognising the limitations of desk-based data and the preliminary nature of soil survey observations, a picture of the papar and their relationship with the land they occupied in the Northern and Western Isles and in Caithness begins to emerge from this study. We would suggest that if incoming Vikings and Norse were applying the papar name, then it was being applied to at least two distinctive but perhaps integrated ecclesiastical communities. One community was associated with secluded and more remote island areas very often with some of the best agricultural land, with this pattern arguably more evident, but not exclusively, in the Western Isles. Whether this group deliberately sought out these locations, one step away from the eremitic community occupying isolated stacks but with whom they could have been integrated, or whether a resident secular population offered secluded areas is as yet uncertain. A second group, perhaps more evident in Orkney and Shetland, but again not exclusively, is more associated with the settlement names and appear to be located in more central and important locations and often on slightly poorer quality agricultural land. We suggest that these communities were part of a more densely populated cultural landscape. A variant of this is evident in Shetland where we suggest a papar located in areas of poorer quality land providing a domestic livestock element to the economy of a larger, more central, ecclesiastical settlement. Irrespective of the interpretations given above, it is clear that the majority of papar names in the Northern and Western Isles are associated with areas of very good to medium quality agricultural land which, with the agricultural land management of the period, would allow good yields. It follows that as well as the eremitic solitude seeking papar finding their way to the Northern and Western Isles, there is emerging evidence of agriculturally based early ecclesiastical communities, some occupying more secluded areas while others possibly living adjacent to or within the secular community. A key task is now is to determine the nature of land management practices associated with these agriculturally-based papar and to determine their contribution, over and above the places that bear their name, to the development of the cultural landscape in the Northern and Western Isles. We gratefully acknowledge the support of the Carnegie Trust for the Universities of Scotland. We are also grateful for the research assistance of Lorna Johnstone, University of Glasgow, Kristján Ahronson, University of Edinburgh, Janet Hooper and Anke-Beate Stahl. Thanks are also due to Mr K. Campbell and Mr D. Plunkett for access to Pabbay. Arge, S.V. (1991). The Landnám in the Faroes. Arctic Anthropology 28, 101-120. Barber, J.W. (1981). Excavations on Iona, 1979. Proceedings of the Society of Antiquaries of Scotland 111: 282-380. Bennett, K.D., Boreham, S., Sharp, M.J. and Switsur, V.R. (1992). Holocene history of environment, vegetation and human settlement on Catta Ness, Lunnasting, Shetland. Journal of Ecology 80, 241-273. Brady, K. (2002). Brei Holm, Papa Stour: in the footsteps of the papar? In B. E. Crawford (ed.) The Papar in the North Atlantic: Environment and History. St Andrews: St John’s House papers No 10. pp. 69-82. Brady, K., Duncan, J.S., McHardy, I., and Morris, C.D. (2000). Brei Holm Survey and Excavations Papa Stour, Shetland. Glasgow: University of Glasgow / Historic Scotland. Buckland, P.C., Edwards, K.J., Blackford, J.J., Dugmore, A.J., Sadler, J.P. and Sveinbjarnardóttir, G. (1995). A question of landnám: pollen, charcoal and insect studies on Papey, Eastern Iceland. In: Ecological Relations in Historical Times: Human Impact and Adaption. R.A. Butlin and N. Roberts (eds.). Oxford: Blackwell. pp. 245-263. Dumville, D.N. (2002). The north Atlantic monastic thalassocracy: sailing into the desert in early mediaeval insular spirituality. In B. E. Crawford (ed.) The Papar in the North Atlantic: Environment and History. St Andrews: St John’s House papers No 10. pp. 121-131. Fossitt, J.A. (1996). Late Quaternary vegetation history of the Western Isles of Scotland. New Phytologist 32, 171-196. Gammeltoft, P. (2004). Among Dímons and Papaaeys: What kind of contact do the names really point to? Northern Studies 38, 31-50. Hannon,G. E., Wastegård,S., Bradshaw, E., and Bradshaw,R.H.W. (2001). Human impact and landscape degradation on the Faroe Islands. Proceeding of the Royal Irish Academy 101B, 129-139. Jóhansen, J. (1978). Cereal cultivation in Mykines, Faroe Islands AD 600. Danmarks Geologiske Undersøgelser Årbog 1978: 93-103. Lowe, C. E. (2002). The papar and Papa Stronsay: 8th century reality or 12th century myth? In B. E. Crawford (ed.) The Papar in the North Atlantic: Environment and History. St Andrews: St John’s House papers No 10. pp. 83-95. MacDonald, A. (1977). On ‘Papar’ names in north and west Scotland. Northern Studies 9: 25-30. MacDonald, A. (2002). The papar and some problems: a brief review. In B. E. Crawford (ed.) The Papar in the North Atlantic: Environment and History. St Andrews: St John’s House papers No 10. pp. 13-30. Molloy, K. and O’Connell, M. (1993). Early land use and vegetation history at Derryinver Hill, Renvyle Peninsula, Co. Galway, Ireland. In F.M. Chambers (ed.) Climate Change and Human Impact on the Landscape. London: Chapman Hall. pp. 185-199. Molloy, K. and O’Connell, M. (1991). Palaeoecological investigations towards the reconstruction of woodland and land use history at Lough Sheeauns, Connemarra, western Ireland. Review of Palaeobotany and Palynology 67, 75-113. O’Connell, M., Molloy, K. and Bowler, M. (1988). Post-glacial landscape evolution in Connemara, western Ireland with particular rerence to woodland history. In H.H. Birks, H.J.B. Birks, P.E. Kaland and D. Moe (eds.) The Cultural Landscape. Cambridge: Cambridge University Press. pp. 487-514. Radford, C.A. R. (1983). Birsay and the spread of Christianity to the north. Orkney Heritage 2: 13-35. Rendall, J. (2002). St Boniface and the mission to the Northern Isles: a view from Papa Westray. In B. E. Crawford (ed.) The Papar in the North Atlantic: Environment and History. St Andrews: St John’s House papers No 10. pp. 31-37. Simpson, I.A. (1997). Relict properties of anthropogenic deep top soils as indicators of infield management in Marwick, West Mainland, Orkney. Journal of Archaeological Science 24: 365-380. Simpson, I.A., Lancaster, S.J and Dockrill, S.J. (1998b). Making arable soils: anthropogenic soil formation in a multi-period landscape. In R.A. Nicholson and S.J. Dockrill (eds.) Old Scatness Broch, Shetland, Retrospect and Prospect. New York: North Atlantic Biocultural Organisation. pp. 111-126. Simpson, I.A. and Guttmann, E.B. (2002). Tansitions in early land management in the Northern isles – the papar as agricultural innovators? In B. E. Crawford (ed.) The Papar in the North Atlantic: Environment and History. St Andrews: St John’s House papers No 10. pp. 59-67. Soil Survey of Scotland (1970). 1:63,360 Soil Map of Latheron and Wick, Caithness. Aberdeen: Macaulay Institute for Soil Research. Soil Survey of Scotland (1979). 1:50,000 Soil Maps of Orkney – Orkney Mainland, Orkney Northern Isles and Orkney Hoy. Aberdeen: Macaulay Institute for Soil Research. Soil Survey of Scotland (1982a). Orkney and Shetland – 1:250,000 Sheet 1. Aberdeen: Macaulay Institute for Soil Research. Soil Survey of Scotland (1982b). The Outer Hebrides – 1:250,000 Sheet 1. Aberdeen: Macaulay Institute for Soil Research. Vésteinsson, O. (2000). The archaeology of Landnám: early settlement in Iceland. In: Vikings: The North Atlantic Saga. W.W. Fitzhugh and E.I. Ward (eds.). Washington and London: Smithsonian Institution Press. pp. 164-174.